Lan Ha (Lan Hạ) bay, of which the beauty is compared with that of Halong Bay in Quang Ninh (Quảng Ninh), Vietnam (Việt Nam) is located in the south area of the bay, surrounding Cat Ba (Cát Bà) Island of Hai Phong (HảiPhòng) province. This promises to be an attractive destination for tourists. Located in the south of Halong (Hạ Long) Bay and in the east of Cat Ba island, Lan Ha bay has an area of 7,000 hectares featuring spectacular beauty of dense small and large islands, with many interesting shapes. Unlike Halong Bay, all of the islands in Lan Ha Bay are covered with green trees, despite there are many very tiny island. 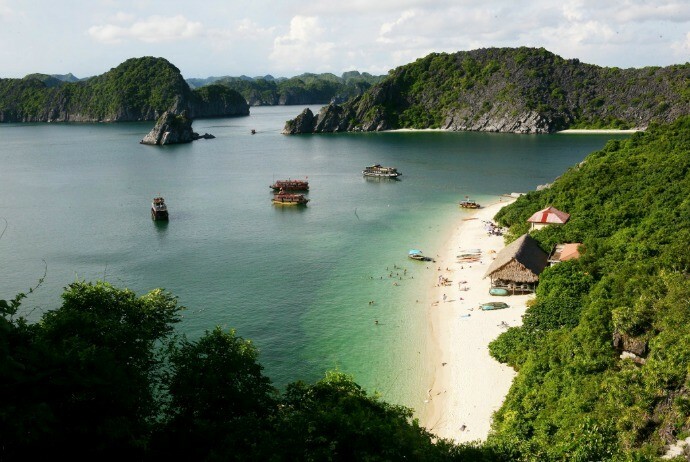 Despite of not being well-known for tourists, Lan Ha Bay is assessed as one of the most beautiful bays in Vietnam. When the autumn comes, Lan Ha Bay gets its most beautiful state with slight sunlight, mild and cool breeze of the ocean, making tourists comfortably enjoy the refreshing, relaxing while boating to admire the bay. 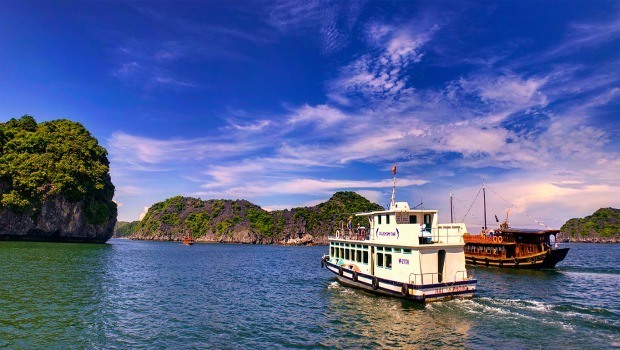 With a cool and fresh climate, tourists could visit Lan Ha Bay at any time of the year. 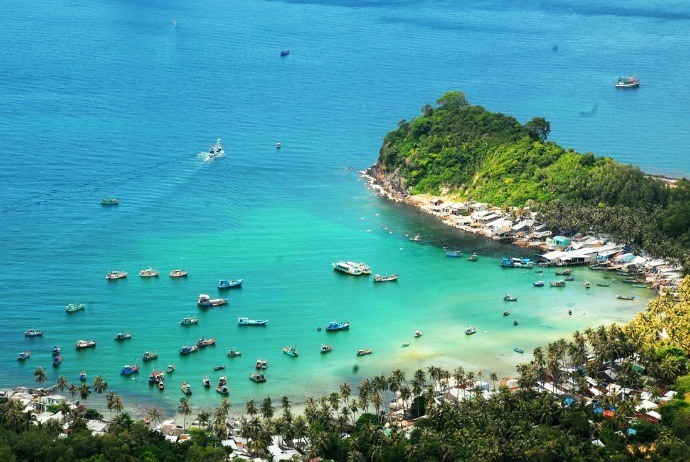 However, domestic tourists often travel from April to October, but international tourists often travel to Lan Ha from November to March each year. From the centre of Cat Ba island, you move to Ben Beo and buy ticket to visit the bay before renting the boat to go to the place you want. If you just want to go around the bay (near the seashore and not go too far), you can rent a motor boat of local people for convenience. 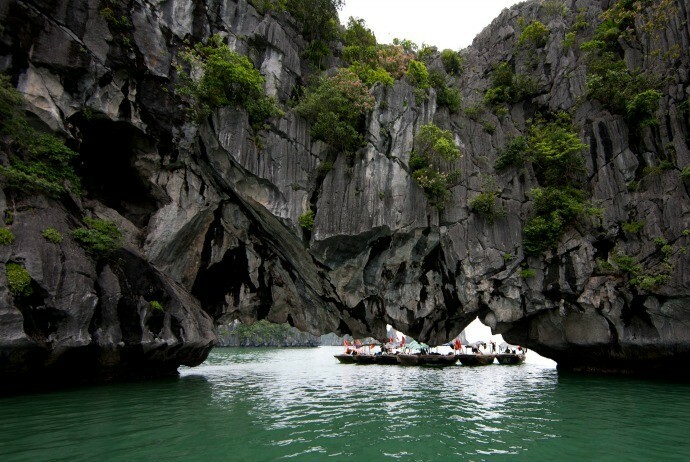 Located on Bo Hon (Bồ Hòn) Island, the front is Hon Con Rua (Hòn Con Rùa) and the right is Cong Troi (Cổng Trời), Luon Cave’s escarpment is stiff and water is blue and smooth all year round. The cave always attracts tourists not only because of the unique shapes but also the harmony and appealing natural scenery. Tourists often go on boat from Ben Beo (about 10 minutes) and through Cai Beo (Cái Bèo) fishing village and some other tiny islands to reach Monkey Island. Previously, Monkey Island was called Cat DuaIsland because there are many wild pandanus trees looking good but not edible. Currently, the island is often called Monkey Island. The reason is that there are over 30 monkeys by the rangers of the National Park Cat Ba bring here. They usually play with the tourists at the beach, eat foods delivered by tourists such as bananas, apples, tangerines, candy… Funny monkeys playing and climbing impress those people who ever came here and gradually people call this island as Monkey Island. 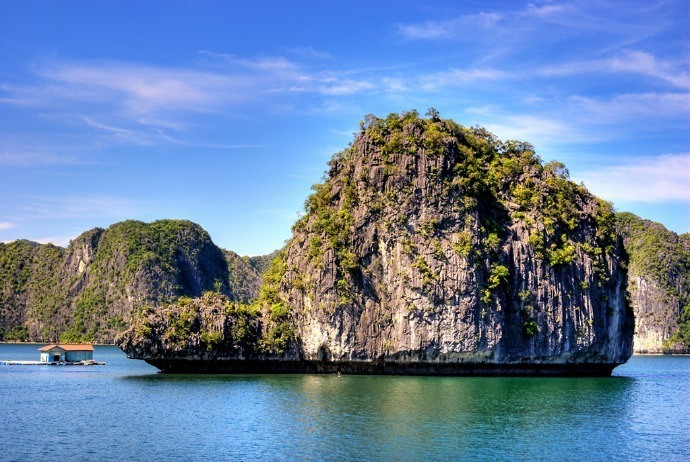 This is a small island located in the Lan Ha Bay with shapes like the turtle swimming on the water surface. The island is located close to the Ben Beo (Bến Bèo) road to Viet Hai (Việt Hải) village. ChuongIsland has other names which are Nen (Nến) island, But (Bút) Island, Bap Chuoi(Bắp Chuối) Island. This is a small island located on the way from Cat Ba Island to Cua Van (Cửa Vạn) fishing village. Swimming in the bay will bring to you an interesting experience. There are a lot of small beaches in Lan Ha Bay for you to come to enjoy and swim. 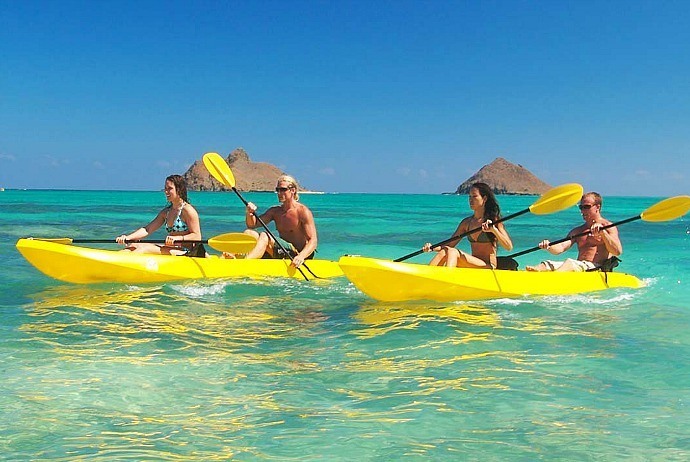 It is very lovely to swim at Van Boi Con Island or Monkey island. 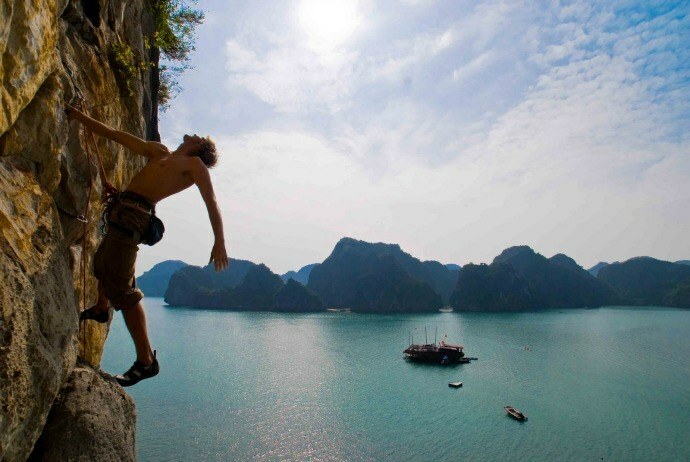 Cat Ba has an international rockclimbing center so you could book a half or full-day rock climbing tour at booking office of Monkey island resort. 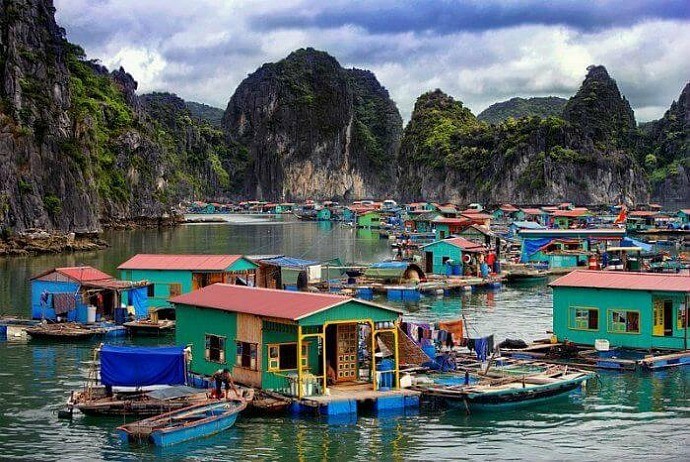 You could visit Viet Hai (Việt Hải) harbor from Lan Ha Bay and then take a bicycle or motorbike to go 6km to visit Viet Hai fishing village in Cat Ba (Cát Bà) National Park. Visit Cai Beo (Cái Bèo) floating village in which people have to stay in those floating houses and children here go to school using boats.